Woodlands Elite Cheer Co., L.P. - SPECIAL EVENTS	if you are not redirected in a few seconds. 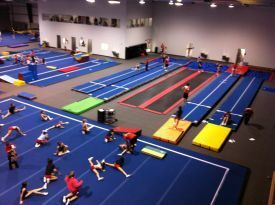 Woodlands Elite offers several options concerning school squad training. Our typical sessions last from 1 to 1 1/2 hours of instruction ONE time per week. Your athletes receive top rated, elite level coaching in a safe, positive & productive learning environment. We boast top rated training equipment & a safe facility for training. Our veteran staff provide instruction in the areas of tumbling, stunting, dance, cheer technique, strength, conditioning, flexibility, and an endurance program to enhance the athleticism of each cheerleader. Please contact jasmine@woodlandselite.com for pricing. Please contact schools@woodlandselite.com for pricing. In addition WECC is able to offer your program a list of possible competitions, pep rally help, motion technique, cheers, sidelines, band dances, choreography, music, and information/training on stunts, pyramids, baskets, tumbling, and safety guidelines. Please contact Jasmine Arnold at 281-681-1253 ext. 101 with any questions on our school training packages.